All flights are checked against schedules at the time of booking to ensure the information is correct, and on the day all flights are monitored and the chauffeur only dispatched when the flight arrival is imminent. Our rates for transfers include 30 minutes waiting and, by checking all flights in advance, extra waiting time is rarely charged. If for any reason a client does not appear, we do not stand the car down and charge a "no show", we do everything in our power to find them. 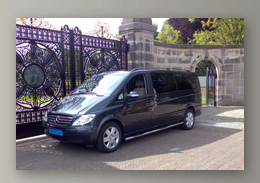 We can also provide the same service for other entry points, such as train stations, as well as private flight arrivals into private terminals. For other point to point transfers we offer a discounted rate on our standard tariff, please contact us for more information.